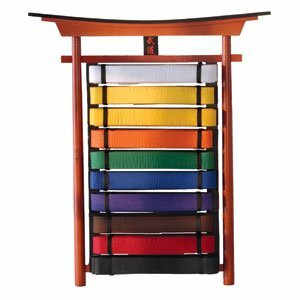 The colors of the belts in taekwon-do represent a variety of things, on many levels. They are not randomly selected. White, yellow, green, blue, red and black — the six colors of the taekwon-do belts. “The colors have not been arbitrarily selected. They are in fact, steeped in tradition. The colors of black, red and blue denote the various levels of hierarchy during the Koguryo and Silla Dynasties,” writes General Choi in the Encyclopedia of Taekwon-do. They tell a symbolic story. According to Choi, white is the innocence, as that of a beginning student of taekwon-do; yellow is the Earth from which a plant sprouts and takes root as the Taekwon-do foundation is laid; green is the plant’s growth as skills in taekwon-do develop; blue is the Heaven, towards which the plant grows into a towering tree as training progresses; red signifies danger, cautioning the student to exercise control and warning opponents away; and finally black is the opposite of white, signifying maturity and proficiency in taekwon-do and imperviousness to night. But this order of colors far predates the founding of taekwon-do, or even taek’yon. There are many references to the order as it stands in the writings of Leonardo da Vinci on color theory, in Druidic lore and the ancient Chinese art called Feng Shui. The druids, whose colored robes were in the same order with one exception, felt the same way. The final robe was the sum of all colors before hand. In their world, however, the black robes were first, representing the absence of knowledge, and the white robes were the sum of all knowledge acquired in the course of study. The wearers of the white robes were to retain all the knowledge represented in the previous colors. White is the traditional color of the Korean dobok or the Japanese gi. New students wear this as their first belt. In pigments, it is the absence of color; in light, the sum of all colors. White is a color of deep symbolism. It represents honor, purity, virtue and innocence. This is why brides wear white, as do doctors, nurses and chefs. Snow White exemplified the essence of white. Her simple, honest, friendly demeanor wins out over the evil step-mother. Diamonds epitomize the “white” or colorless stone. They are the promise of love, fidelity and honor between husband and wife. White is both the beginning and the end of the belt colors. To look at the well-worn “black” belt of one who had worked long and hard with that belt, it starts to turn white again where the black threads are worn away. White is the color that all knowledge is built upon, until, as when pigments are mixed, black is created. In true yin and yang fashion, for black to exist, there must be white. Yellow is the warmth of a summer day or the sun beaming from a bright blue sky. It is the golden hue of sunflowers and the sniffles created by goldenrod. It is the bright yellow of a “Have-a-nice-day” sticker, the rich saffron of the Buddhist monk’s robes. It is also the second color of belt in taekwon-do. To many Americans, yellow is a color that has dual associations — that of great joy and that of caution. Yellow is spring, daffodils and Easter eggs. But, yellow is also the color of cowardice. It is yellow journalism or having a yellow streak. To wave a yellow flag at a race or see a yellow stop light suggests caution and care. Yellow lines divide the two directions of traffic on a road. Green signifies the plant’s growth as Taekwon-do skill begins to develop. “It’s not that easy being green,” sang Kermit the Frog on Sesame Street. Green belt, the third color in the belt system, is where many students drop out. Psychologically it’s a heavier color, denoting the start of true study in taekwon-do. The first of the intermediate colors, it is here that many realize how much there is to learn, how far there is to go and they quit. In the Western world, blue is the color most people claim as their favorite. It is the bright blue of a summer sky and the mysterious deep blue of night. It is the fourth belt color as well. Blue denotes authority, truth, loyalty and mystery. It also symbolizes quality. Police officers have blue uniforms. The Marines, the Navy, Air Force officers and the Army all wear dress “blues.” The business world is dominated by the ubiquitous “blue suit.” A blue ribbon means first place. Blue chips stocks are the most consistent and high in value, as is a blue chip in poker. Brides traditionally wear something blue at the wedding. It is the color used for the Virgin Mary’s robes in Christianity, of Merlin’s robes in Druidic lore. It is also the color of academic robes worn by philosophers at American universities. Blue is the calm, peaceful night falling or the true blue of friendship. Blue evokes the mystery of the Hope Diamond; the turquoise of ancient Egyptian and Zuni cultures. It is the secrecy of the Blue Lodge of Masonry. To wear a blue belt is to start to learn the vast history, philosophy and mystery of taekwon-do. Red. It’s the first color an infant sees after black and white. It is the color used most frequently in flags. Red evokes excitement, anger and intensity. It is the last color belt before black belt. Red will “increase appetites, adrenaline production, strength and blood pressure.” It’s the color of true love: a Valentine, red lips and nails, and a long-stemmed rose. In China and Bolivia it is the color the bride wears, representing sensuality, joy and love. A common understanding of the red belt is “danger” — to both self and others. Here the thrust for black belt comes into full force. Red is danger and authority. In China, all royal decrees were issued in red. Mars, the “red Planet,” is named after the Roman god of war. It’s the red of a stop sign or of a fire truck. Red commands attention. That’s why most flashing lights for emergency vehicles use it. In Brazil, red cars were outlawed due to the number of accidents involving them — the same reason that in the United States, insurance rates are higher if you drive a red car. There is great joy and passion in red — painting the town red, getting the red carpet treatment, in red letter days. It’s the color of Captain Kangaroo’s coat and Santa’s suit. It’s the color of the devil and of Rudolph’s brilliant nose leading the way home. In the Western world, black is the color of death or nothingness. It is not so in the Eastern countries. In Asia, black is the color of wisdom, silence and eternity. Black is the mystery of the ninjas, the inky color of a moonless night. The color of most graduation gowns, it is also wisdom and depth of knowledge. Black leather covers are the most common for that of a Bible. A man’s black book is a treasured item, not to be shared. It is also the color of a priest’s shirt.